Our campaign for high-end donors offers members an opportunity to make a three-year commitment, with a minimum annual contribution of $1,800. 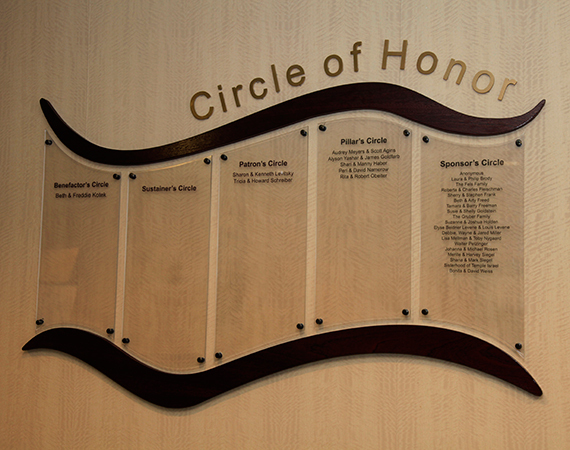 Circle of Honor donors are publicly recognized with a plaque in the main lobby. To inquire about joining the TI-JCC Circle of Honor, please telephone the Temple office: 201-444-9320, or email Rabbi Fine at dfine@synagogue.org. GoodSearch.com is a search engine that donates half its advertising revenue, about a penny per search, to the charities its users designate. Use it just as you would any search engine, get quality search results from Yahoo, and watch the donations add up! GoodShop.com is an online shopping mall which donates up to 37 percent of each purchase to your favorite cause! Hundreds of great stores including Target, Gap, Best Buy, ebay, Macy's and Barnes & Noble. Amazon.com will automatically donate a percentage of your purchase amount to Temple Israel when you go there via this link.